Universidad de Chile made it nine straight wins to top Copa Libertadores Group 8 and set-up a last-16 tie with Depotivo Quito by taking revenge from their opening group game defeat; El Chuncho recorded a 2-1 victory over Colombian’s Atlético Nacional. There were rare starts for 18-year-old Sebastián Martínez and Emilio Hernández but Jorge Sampaoli resisted the urge to make wholesale changes knowing a win would see Los Azules top the group and take their place as a seeded team in the draw. It only took ten minutes for the first goal to be registered between two of the most impressive sides in the Libertadores so far. And it came from a source that some readers may now be (more) familiar with. Universidad de Chile became one of the first teams to confirm their place in the last-16 of the Copa Libertadores with a fine away performance in Mendoza, completing a double over Argentine’s Godoy Cruz. Chances came thick and fast in the first 45 minutes, which had to be extended to 56 due to floodlight failure mid-way through the half, but it was Ángelo Henríquez’s strike that was the difference. Despite their precarious position in the group Godoy Cruz struggled to threaten La U’s three-man backline often in what was a solid rearguard action, minus one or two blemishes, notably from the long ball. 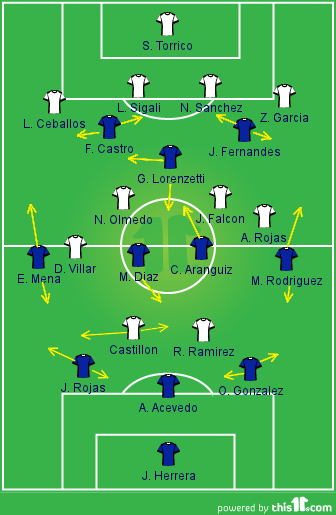 Nery Pumpido, Godoy’s coach, switched to a back three in a 3-4-1-2 from their usual 4-4-2 used in the first leg. However the back three played more like a back five with the wing-backs being forced deep by La U’s; Matías Rodríguez and Eugenio Mena forceful and aggressive in their wing-play as the Chileans fluid 3-4-3 dominated the game. Universidad de Chile left it late to jump back into second place in Group 8 of the Copa Libertadores, overcoming Peñarol 2-1 and ending the 2011 finalists’ campaign in the process. La U went ahead early in the first half and looked in a confident position even when José Rojas squandered a penalty. However it appeared as if the missed chance from 12 yards would cost them as the Uruguayans equalised after the break but Matías Rodríguez popped up in injury time to score another crucial goal which leaves Los Azules only one point behind group leaders Atlético Nacional. With little under three minutes on the clock Junior Fernándes powered down the cross and fired a low cross which was spilled by Fabián Carini and bundled in by Rodríguez. As the Chilean clubs prepare to return to Copa Libertadores action after a two week hiatus it seems a good time to assess the trio’s performances at the midway point of the competition’s group stage. Universidad de Chile came into the tournament as one of the favourites following their Copa Sudamericana win last year despite losing the effervescent talents of Eduardo Vargas, the goals of the Gustavo’s, Canales and Vargas, and the experience of centre back Marcos González. Placed in a tough group they have performed admirably as they strive for the fluidity in of 2011. Universidad Católica have been the polar opposite of their domestic form. They have struggled for consistent results, drawing all three of their group games has left them in an awkward position having already played two away games in a competition notorious for its laborious away trips. In the same group, Unión Española have been one of the surprise packages of the tournament so far, wracking up two wins and a draw after negotiating a difficult first round play-off against Mexican side Tigre. With Mauro Díaz and Emmanuel Herrera impressing they are, surprisingly, best placed of the three teams to qualify. 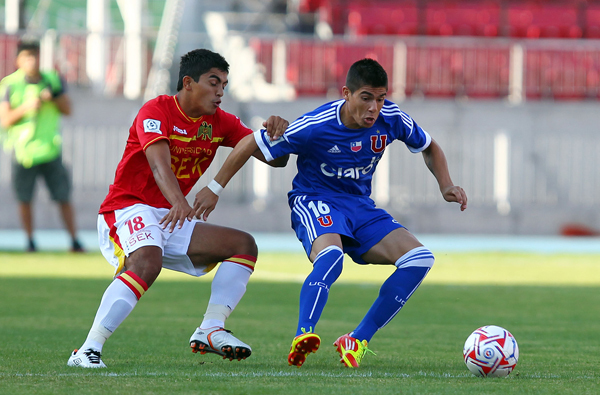 Universidad de Chile v Godoy Cruz. Chile v Argentina. The match, in some quarters, was being billed as the first-leg of the ‘play-off’ for second place in Group 8 of the Copa Libertadores. With Atlético Nacional running riot in Uruguay against Peñarol the previous evening – taking their points tally to six out of six – the Colombian’s look certainties to qualify for the knock-out stages, especially with the telepathic understanding between Macnelly Torres and Dorlan Pabón. 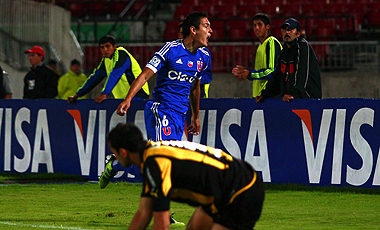 In week one Nacional dispatched of Universidad de Chile who, missing Matías Rodríguez, fielded a lop-sided 3-4-1-2. Wednesday evening’s game saw the Argentine wing-back return to the side allowing Sampaoli to revert to a balanced 3-4-1-2 system which the squad are comfortable and accustomed to. Albert Acevedo has replaced Marcos González as the middle of the three centre-backs after the latter’s move to Flamengo. With Raúl Ruidíaz injured Junior Fernándes filled the role of Eduardo Vargas on the right of the attack but with freedom to migrate to other positions when necessary. Other than the reinstatement of Rodríguez the most important decision was the positioning of Gustavo Lorenzetti. Similar to the role he played against Flamengo when La U won 4-0 in Brazil he started behind Castro and Fernándes. 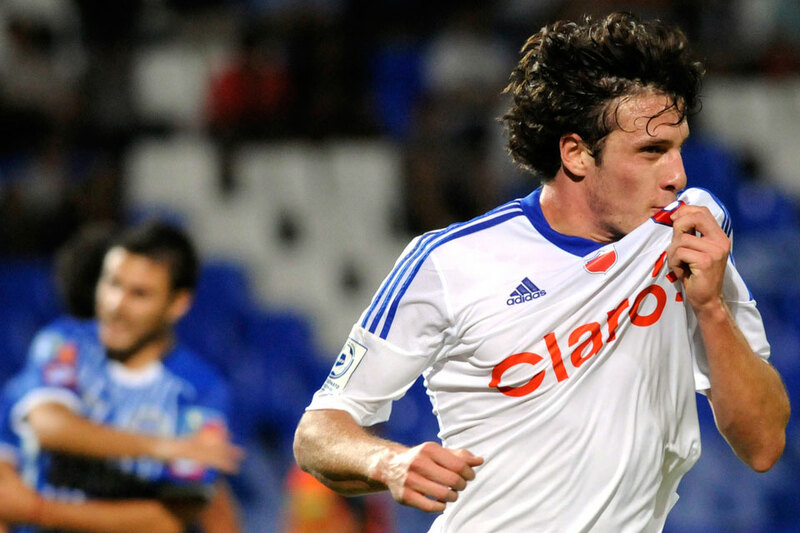 In essence Los Azules were playing without an out-and-out striker, and it suited them. Nery Pumpido lined up Godoy Cruz Antonio Tomba – to give them their full name – in a 4-4-2. The Argentine Dirk Kuyt (more on that soon) Facundo Castillón and Rubén Ramírez led the line with Diego Villar stationed on the right. Similar to the majority of Copa Libertadores results this week there were plenty of goals with one team, if you use the score line as a bearing, emphatically coming out on top. Although it did not look like going that way to begin with, La U found their ‘Copa Sudamericana rhythm and rhyme’, turned the screw and exploited the Argentine’s high-line and their almost non-existent pressure on the ball; a paradise for an enganche like Lorenzetti.